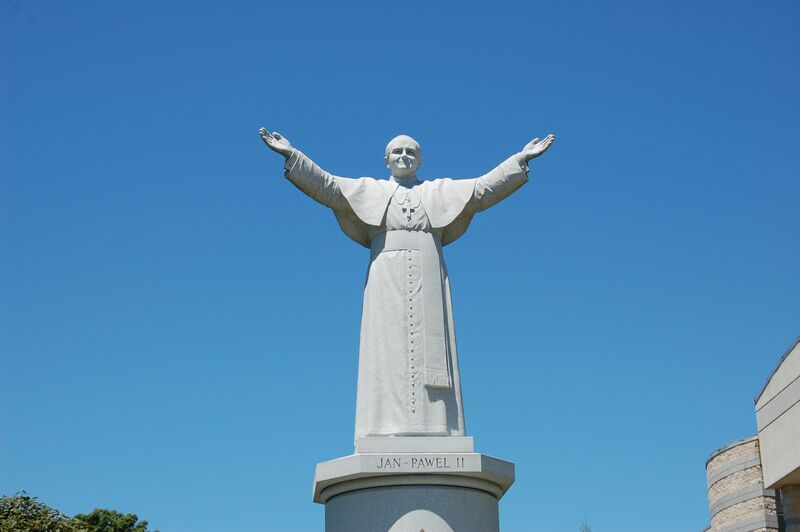 Saint John Paul II, The National Shrine of Our Lady of Czestochowa, Philadelphia Pennsylvania. Yes, April 27 is the day St. Pope John Paul II was canonized. He attended the Second Vatican Council initiated by Pope John XXIII, who also was canonized on this day. Born Karl Wojtyla, Pope John Paul was an actor, poet, athlete, playwrite, priest and philosopher. 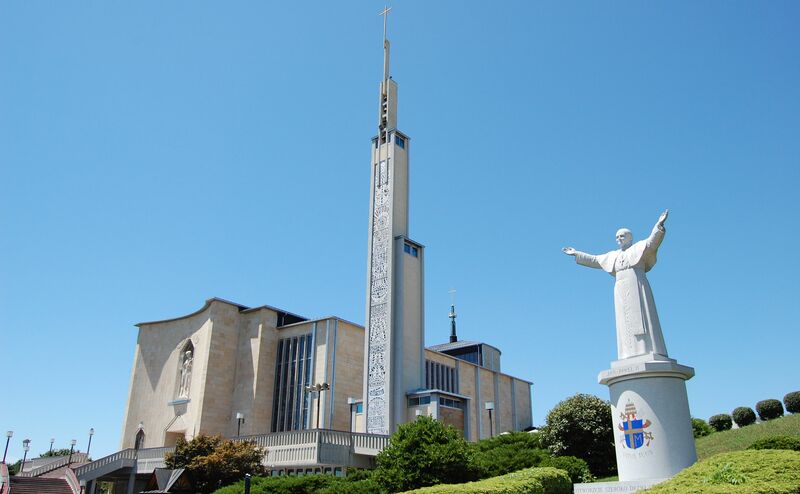 St. John Paul II visited the Shrine of Our Lady of Czestochowa on two occasions while a cardinal. Karol Cardinal Wojtyla first visit was in 1969 and again in 1976 while attending the Eucharistic Congress held in Philadelphia. He became the 264th Pope of the Catholic Church two years later in 1978. John Paul II was the first non Italian pope since Pope Adrian VI who died in 1523. 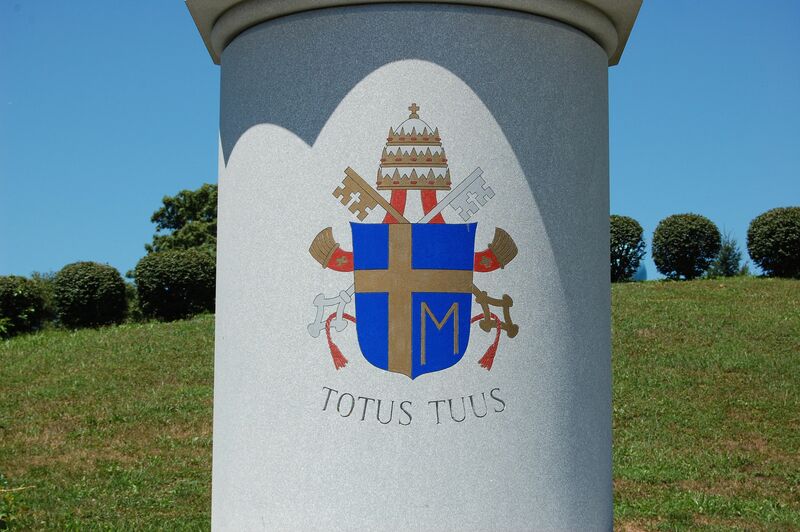 Coat of Arms of Pope John Paul II with the Marian Cross. The Letter M is for Mary, the mother of Jesus, to whom he held strong devotion. John Paul II created Divine Mercy Sunday which is celebrated on the first Sunday after Easter. It is originally based on the devotion to the Divine Mercy that Saint Faustina Kowalska reported as part of her encounter with Jesus. St. Faustina Kowalska, a Polish nun reported visions and visitations from Jesus and conversations with Him. She could read souls! John Paul II beatified Sr. Maria Faustina Kowalska on April 18, 1993 and canonized her on April 30, 2000. St. Paul the Hermit, a strong influence at the Shrine of Our Lady of Czestochowa. The Pauline Fathers, like John Paul II, have a strong devotion to the Blessed Virgin Mary. Their main monastery is in Czestochowa, Poland, where they continue to reside. 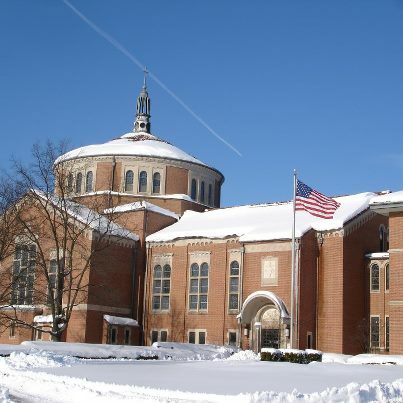 The Pauline Order received permission from the Holy See to establish a monastery in Doylestown, Pennsylvania, and subsequently built Our Lady of Czestochowa Shrine. 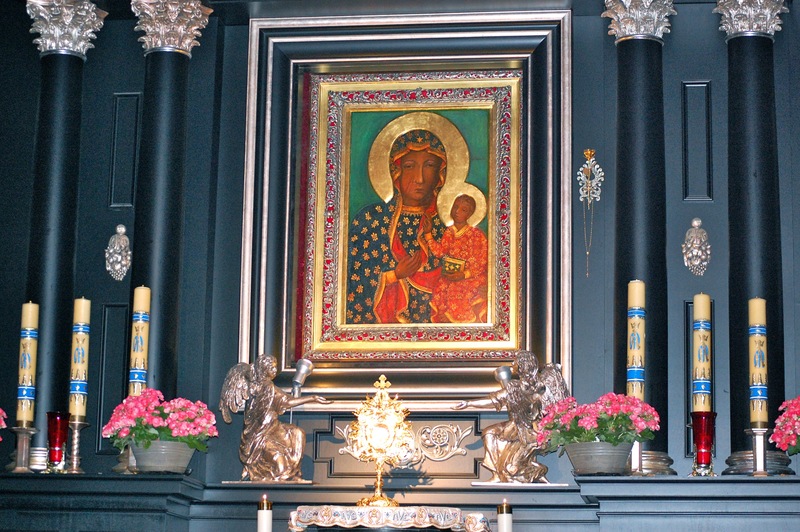 In the main church is the Miraculous Icon of Our Lady of Czestochowa, which was blessed by Pope John XXIII on February 10, 1962, who also became a saint. 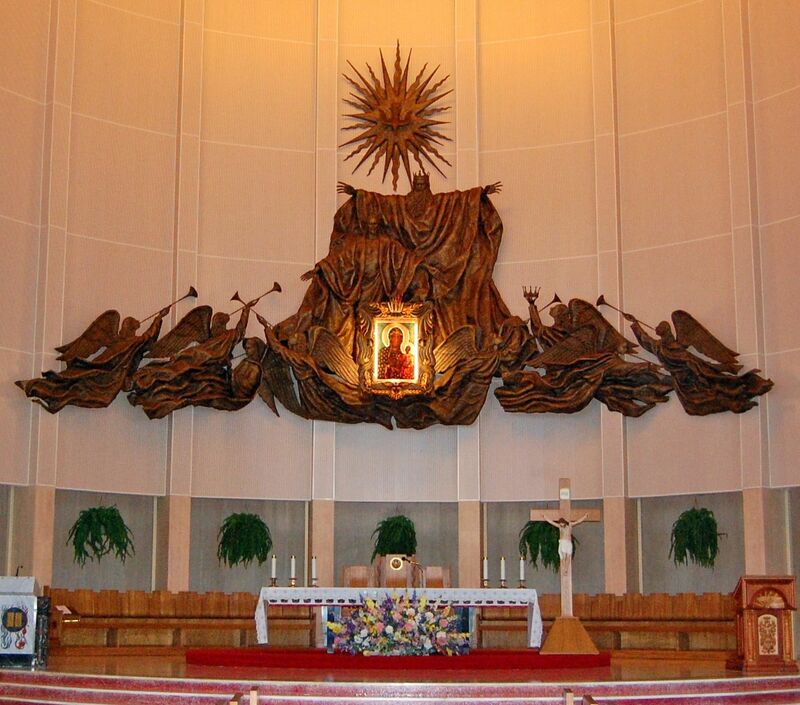 The Icon of Our Lady hangs behind the altar in the main nave and depicts the Holy Trinity. God the Father, with His arms stretched out like the wings of a large bird, enfolds Jesus Christ and all God’s people. 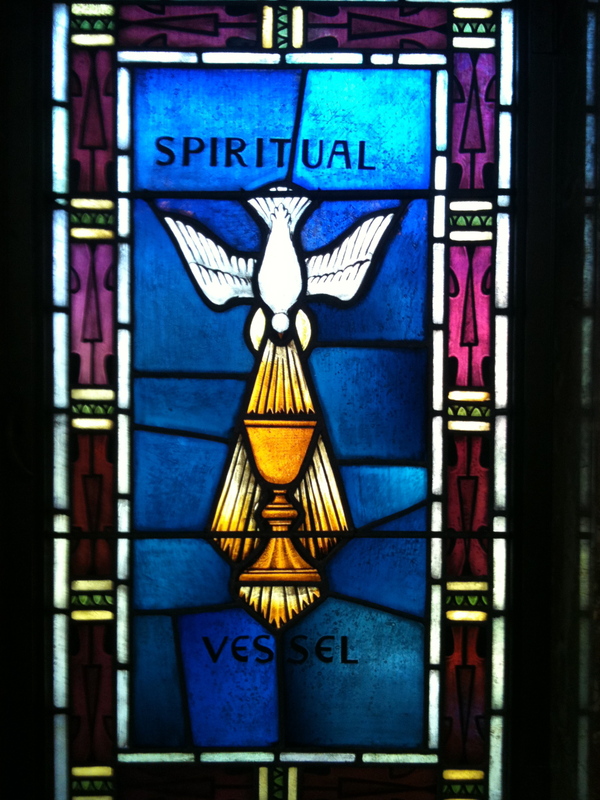 Above them is shown a dove, the symbol of the Holy Spirit. Below them, a choir of angels, with their golden horns, extol the glory of God. 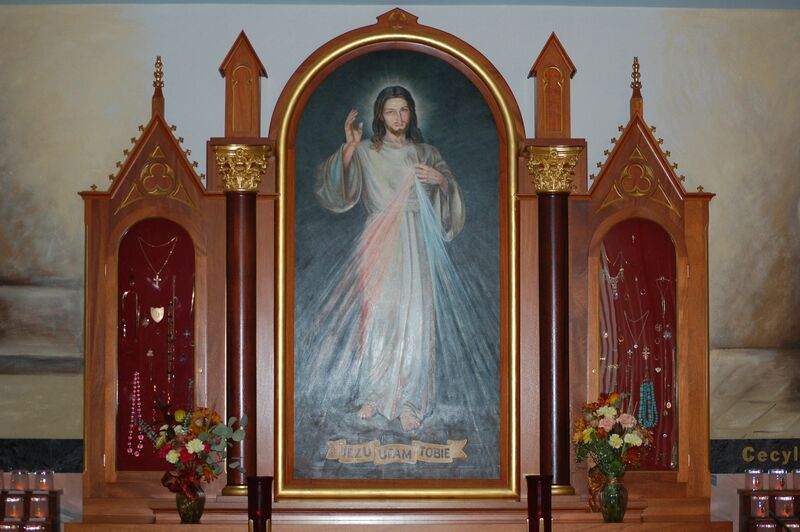 The Chapel of Divine Mercy, within The National Shrine of Our Lady of Czestochowa, Philadelphia Pennsylvania. John Paul II died on the vigil of Divine Mercy Sunday, April 2, 2005. Entrance to the shrine complex. Feast day is October 22nd, the anniversary of his inauguration to Pope in 1978. World Day of the Sick feast day on February 11 coincides with Our Lady of Lourdes from the many healings reported at the shrine. Shrine at Lourdes in France. 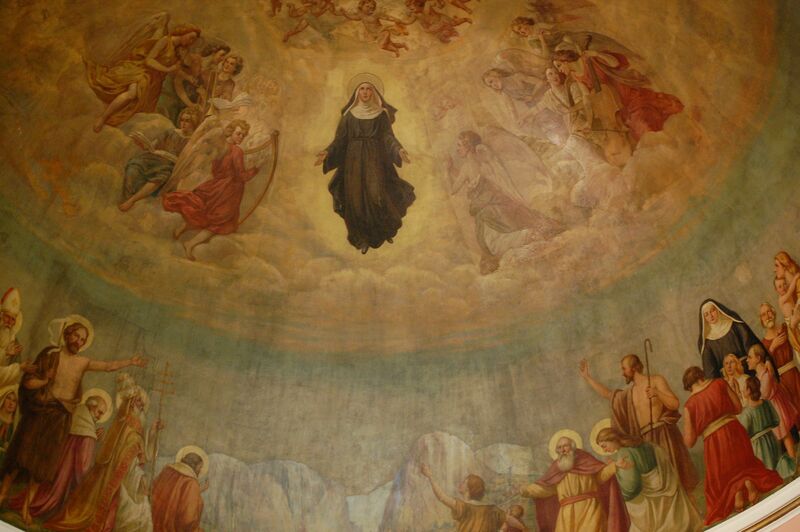 There were eighteen apparitions of the Blessed Virgin Mary to St. Bernadette Soubiroux between February and July 1858. There was a spring flowing near the grotto where the 9th apparition, where the Lady suggested that Bernadette take a drink. 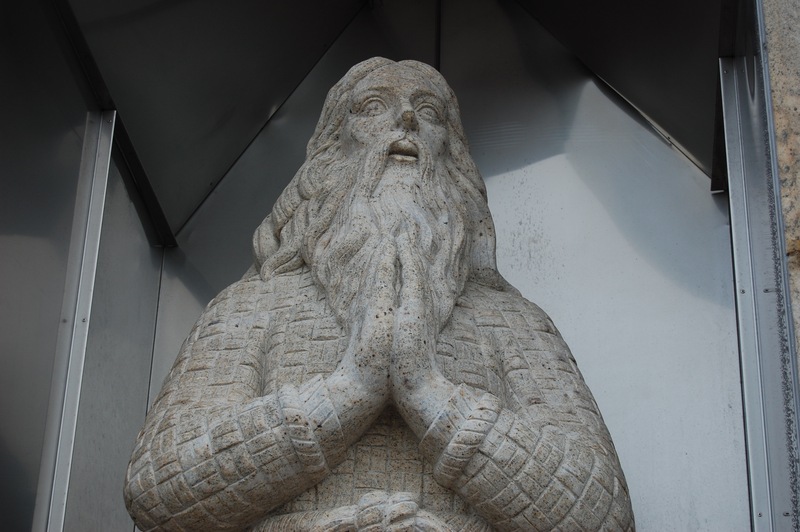 There have been many cures of ailments here, even though Bernadette said there was nothing special in the water, only that it allowed pilgrims to have faith through prayer. Grotto with small stream at Lourdes France. During the 13th apparition, Bernadette was told to build a chapel at the grotto. Current chapel built up over the years is now a major pilgrimage destination for Catholics. On left, actual photo of St. Bernadette at passing. On right incorruptible body and her incorruptible face. 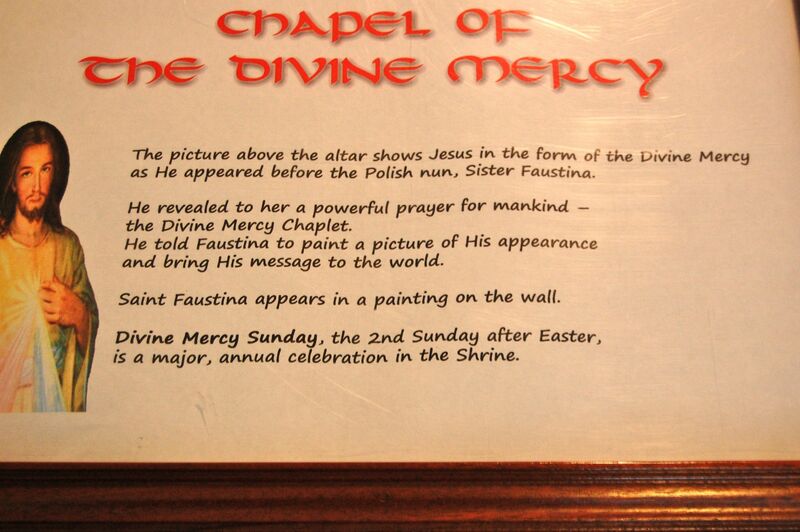 John Paul II created Divine Mercy Sunday which is celebrated on the Sunday after Easter. It is originally based on the devotion to the Divine Mercy that Saint Faustina Kowalska reported as part of her encounter with Jesus. St. Faustina Kowalska, a Polish nun reported visions and visitations from Jesus and conversations with Him. John Paul II beatified Sr. Maria Faustina Kowalska on April 18, 1993 and canonized her on April 30, 2000. The Order of St. Paul the Hermit was founded during the first half of the 13th century in Hungary. The members of the Order were actual hermits who lived in the caves in Hungary. For their patron they chose St. Paul the Hermit, thereby acquiring the name “Pauline Fathers”. 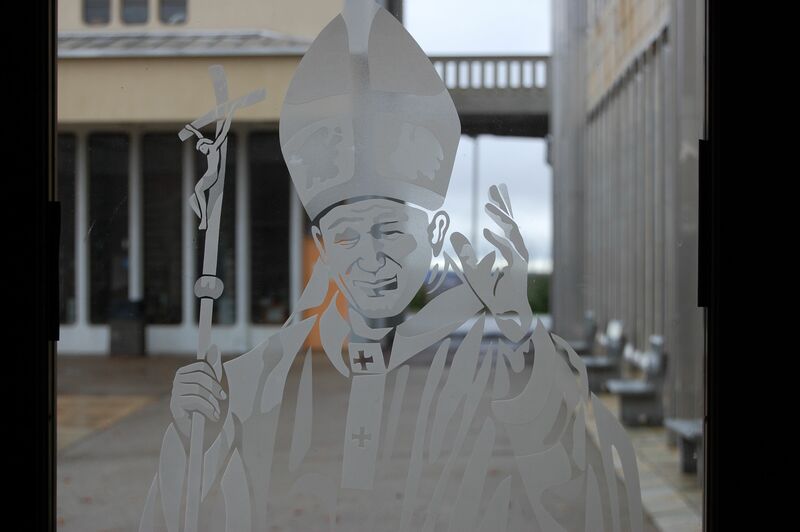 John Paul II had an affection for the Pauline Fathers religious order, and helped persevere the order in Poland. The Pauline Fathers, like John Paul II, have a strong devotion to the Blessed Virgin Mary. Their main monastery is in Czestochowa, Poland, where they continue to reside. The Pauline Order received permission from the Holy See to establish a monastery in Doylestown, Pennsylvania, and subsequently built Our Lady of Czestochowa Shrine. 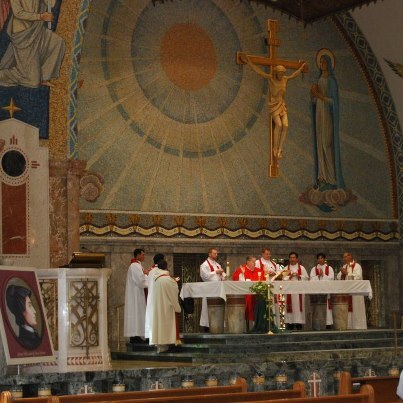 The Chapel of Our Lady of Czestochowa, located at The National Shrine of Our Lady of Czestochowa on Adoration Day. This chapel is a replica of the chapel found at the Jasna Góra Shrine in Poland. At the heart of the chapel is a copy of the Miraculous Icon of Our Lady of Czestochowa, blessed by Pope John Paul II, now a Saint. National Shrine of St. Rita of Cascia, Philadelphia, PA.
At the National Shrine of St. Rita of Cascia, located in South Philadelphia PA, a relic of St. Rita and the pillow she laid here head are on display. Her incorrupt body resides in the chapel of Basilica of Santa Rita da Cascia in Umbria, Italy. 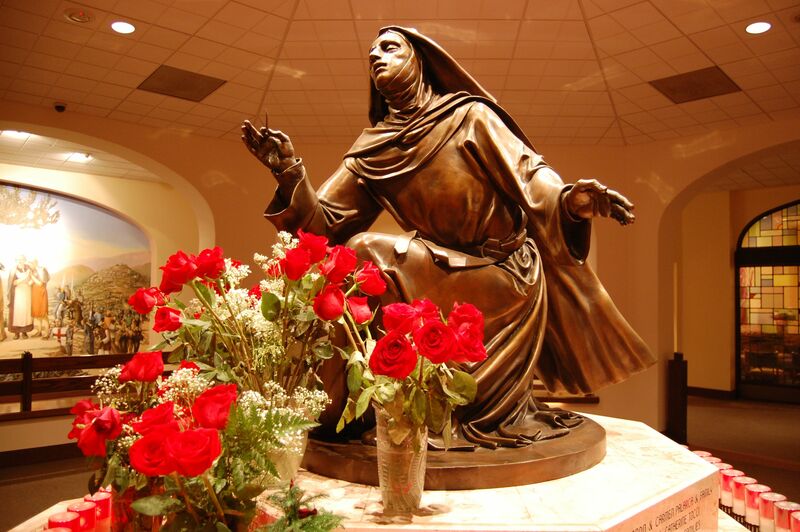 St. Rita is the patron of forgiveness and reconciliation and is known as being the peacemaker. Her feast day is May 22nd, the anniversary of her death. 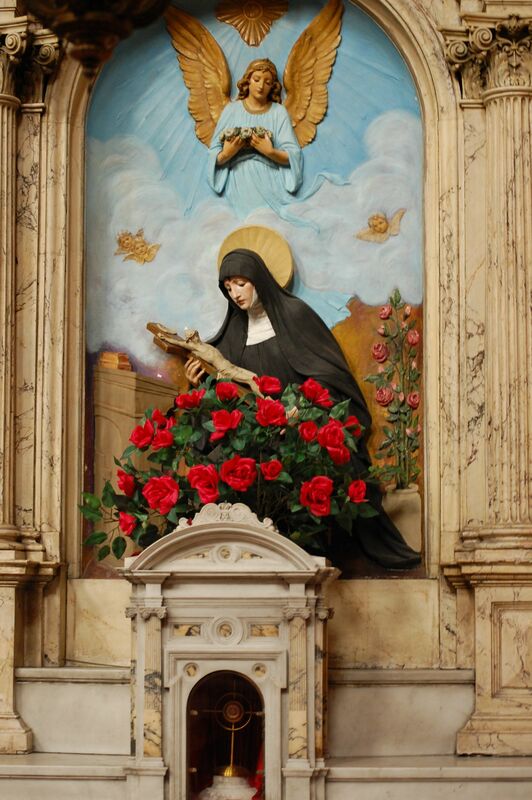 St. Rita had three patron saints that she followed throughout her lifetime. One was St. Nicholas of Tolentine, a friar committed to prayer for the faithfully departed. The other is St. Augustine and she became an Augustinian nun. 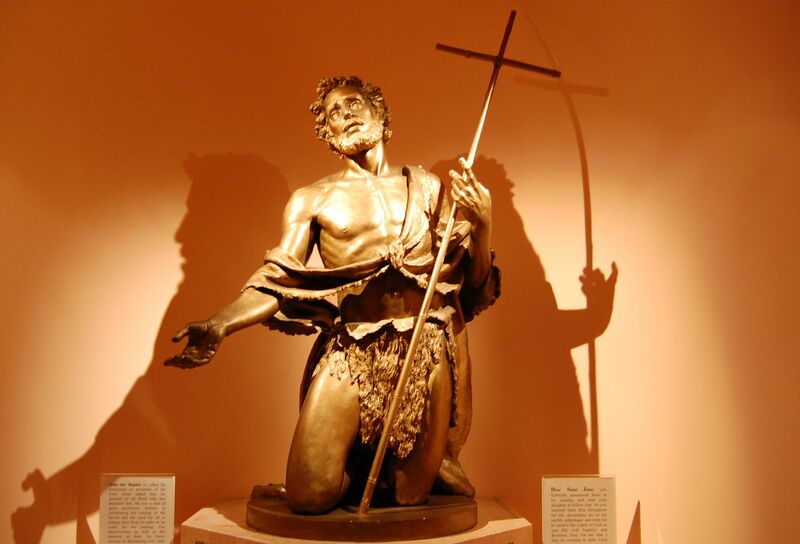 The third patron saint but not the least is John the Baptist, who baptized Jesus. St. Rita holding a single thorn that mystically pierced her forehead (stigmata). At the National Shrine of St. Rita of Cascia, Philadelphia, PA.
St. John the Baptist. 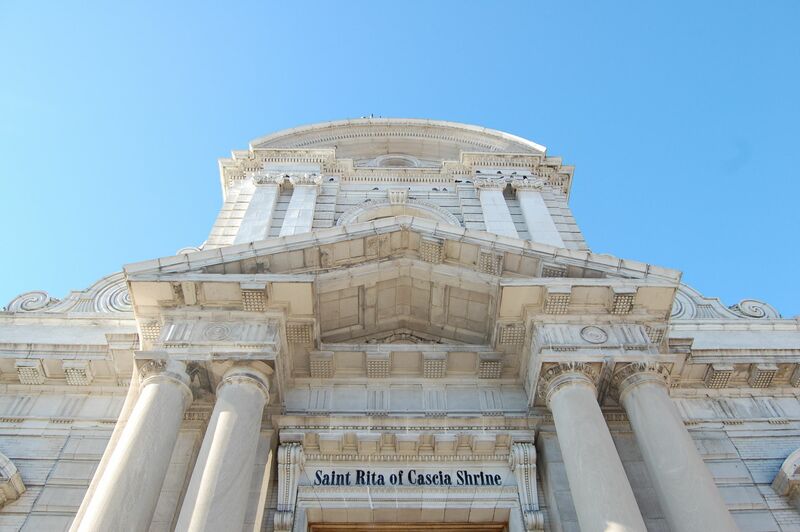 National Shrine of St. Rita of Cascia, Philadelphia, PA.
Rita is remembered as the advocate of reconciliation and making peace. 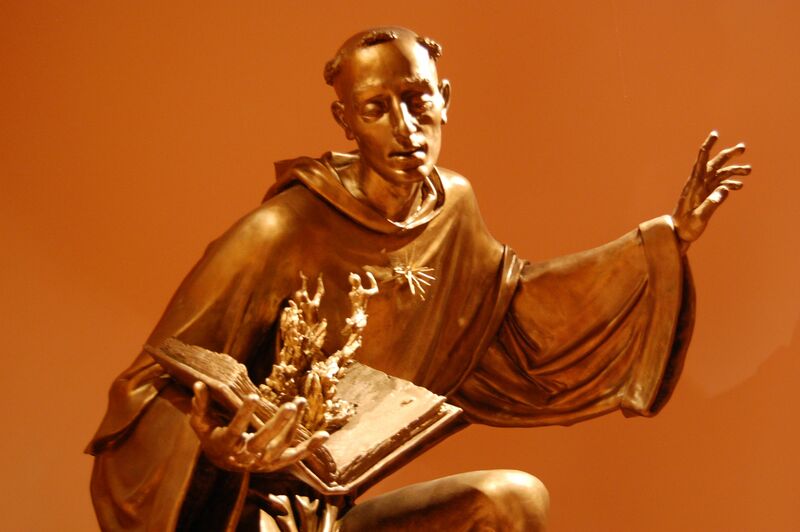 St. Thomas of Villanova (1488–1555) is the patron of the friars who serve the National Shrine of St. Rita of Cascia. As St. Thomas was an Augustinian, most friars at the shrine are also Augustinians. At the age of thirty-six Rita pledged to follow the Rule of Saint Augustine. Later in life at the age of sixty years, she was meditating before an image of Christ and received a stigmata, a small wound on her forehead, resembling a thorn as shown earlier. For the next fifteen years she bore this thorn. In spite of the pain she constantly experienced, she offered herself for the physical and spiritual well-being of others. St. Rita holding cross and roses with relic on display below. National Shrine of St. Rita of Cascia, Philadelphia. St Rita in Heaven at the National Shrine of St. Rita of Cascia in South Philadelphia, PA. The enormity of this feast day can not be understated. There are thousands of roses distributed prior to the Masses that are brought up to the altar with faithful asking for intersessions. Roses are blessed after each Mass on the feast day which is May 22nd. Quite a celebration! The National Shrine of Elizabeth Ann Seton is located in Emmitsburg, Maryland, roughly two hours from Philadelphia. Her feast day is January 4th. 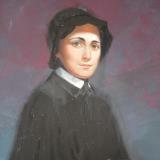 Elizabeth Ann Seton is the first American born saint, born in New York City on August 28, 1774. She was born to into an Episcopal family, her mother was the daughter of an Episcopal minister. Elizabeth Ann Bayley, (her maiden name) married William Seton and had five children. William died in 1803 leaving Elizabeth a widow. Her home in NYC is now the Shrine of Elizabeth Ann Seton. She converted to Catholicism and founded the Sisters of Charity of St. Joseph’s, the first Catholic religious order to originate in the United States, which after her death became linked with the Daughters of Charity of St. Vincent de Paul. 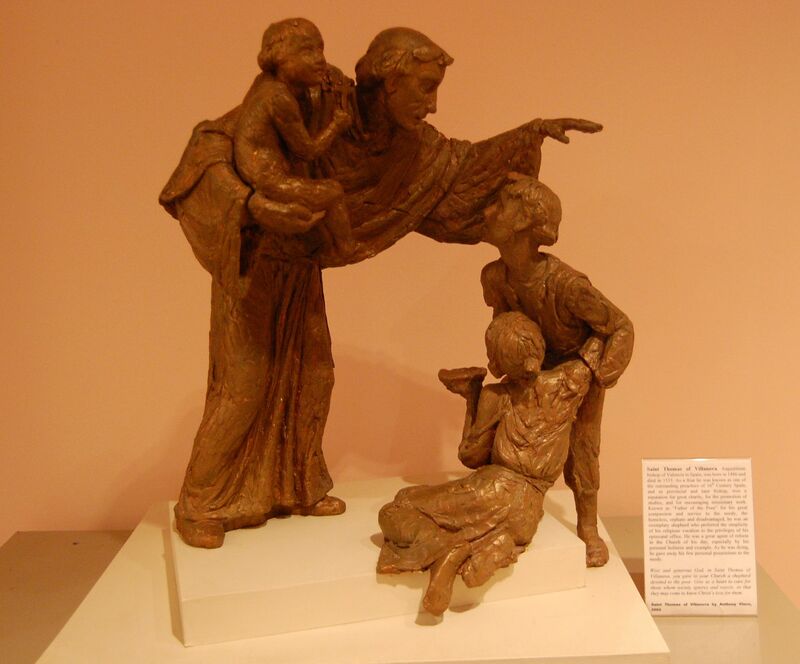 As the name suggests the Daughters of Charity follows the rule of the Vincentian religious order. 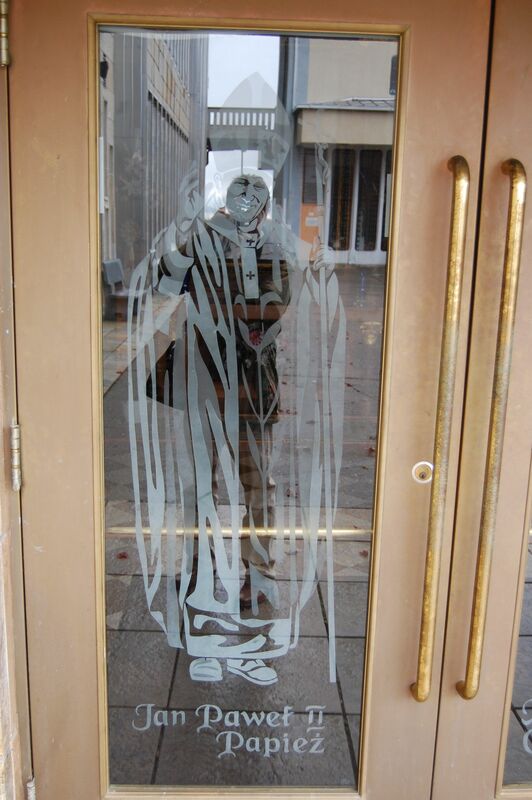 Therefore, you’ll find several miraculous medal icons on the Emmitsburg campus, influenced by the Vincentians in nearby Philadelphia, who manage the Miraculous Medal Shrine. 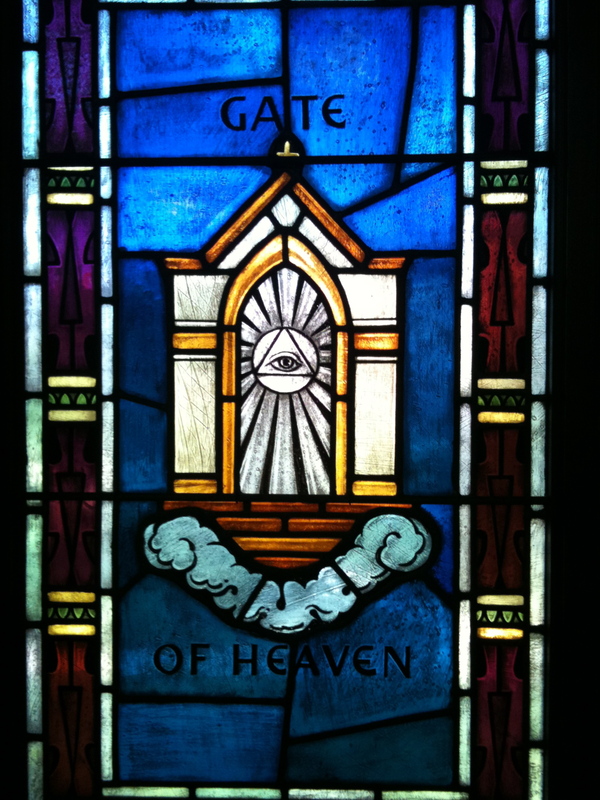 There are over 200 stained glass windows at the shrine.